Looking for tours with mystery and intrigue - shock and awe? How about laughing till you cry? Top it all off with a burst of pride and that just about skims the surface of what our Oberon Class Cold War Submarine HMCS OJIBWA has to offer visitors of all ages. It's big, it's real, and it's in southwestern Ontario. It is quite simply the most unique and exciting experiential tour around. 297.5 feet long, 5 stories high, elegant, imposing - hiding secrets of the Cold War. Canada has a very proud military history of courage, innovation, and preparedness. We have some of the best trained military personnel in the world, so it's no surprise that HMCS OJIBWA and her crew were known as the best of the best in the world of submariners. They really did go where no one else would go. Now, as a museum ship, HMCS OJIBWA is revered as one of the most unique attractions in Ontario and has received many awards for the amazing experience that she provides. It is time to peel back the curtain on some of the exploits of the Silent Service during the Cold War when espionage, stealth and secrets put Canada in the thick of this clandestine world. 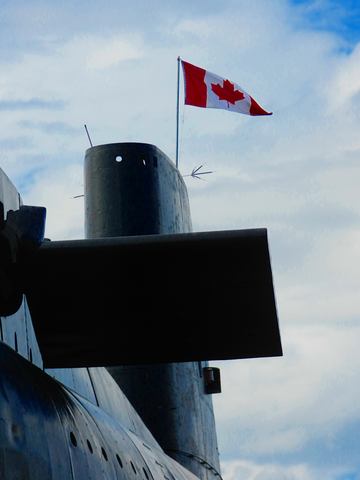 Today, HMCS OJIBWA has a different mission yet, our Cold War Warrior continues to do the unexpected. OJIBWA is a thousand miles from the sea in Port Burwell, Ontario on the north shore of Lake Erie. She is hiding in plain sight, welcoming visitors from around the world who marvel at the true stories of Canadian Cold War Submariners. Learn of the hardships they experienced, the battles they won, and see first-hand the environment they called home. Are you ready to walk for a while in their shoes aboard Canada's best silent hunter?